Announcement Colorful Crowns' beautiful collection of fine hand-knit, 100% cotton baby hats make the perfect baby gift to give or receive. Sized for the newborn to 3 month-old, each adorable hat comes beautifully packaged in an eco-friendly gift box. Colorful Crowns' beautiful collection of fine hand-knit, 100% cotton baby hats make the perfect baby gift to give or receive. Sized for the newborn to 3 month-old, each adorable hat comes beautifully packaged in an eco-friendly gift box. Baby soft. Baby alpaca will keep your newborn so warm. The best baby gift is a hand-knit baby hat by Colorful Crowns! Doing what you love is the best recipe for success! Colorful Crowns was born when Carol Ogg (Head Knitter & Owner) decided to take a chance and follow her passion, after being thrown a curve ball by Corporate America in 2009. Her hand-knit baby hats were already much loved by her friends and family members who had received one as a special baby gift. Carol felt lucky to have her family and her health, so she viewed this as an opportunity to move forward and share her treasured baby hats with sweet peas throughout the world! Colorful Crowns began adorning the world's babies with beautiful, hand-knit hats in January of 2010, and we haven't slowed down since! Colorful Crowns' goal is to create beautiful, hand-knit baby hats that are just as unique and special as the new arrival you're celebrating. Let us take care of preparing the gift and customizing a baby hat to exceed your expectations. We can't help but smile when we receive photos of our customers' babies wearing their new favorite accessory! The baby hats we knit are keepsakes that serve as fond memories of the first precious months of a baby's life. Colorful Crowns is proud to share in this joy! Each adorable Colorful Crown baby hat is hand-knit using 100% cotton yarn and sized to fit the newborn to 3-month old baby. Beautifully packaged in an eco-friendly gift box, we add a hand-written gift message with each order, making it the perfect gift to give AND receive! Colorful Crowns believes in supporting the needs of children, so we are pleased to make an annual donation to the Georgia Chapter of the Pediatric Brain Tumor Foundation. 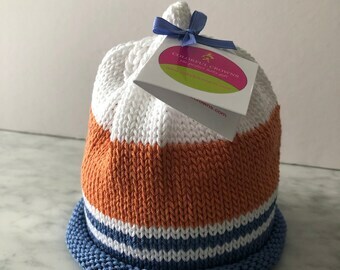 Colorful Crowns was born in 2010 when Carol Ogg decided to take her passion for knitting baby hats from a hobby to a small boutique business in order to share her much loved baby hats with gift givers beyond her circle of friends and family! Colorful Crowns' goal is to create beautiful, hand-knit baby hats that are just as unique and special as the new arrival you're celebrating! Let us take care of preparing the gift and customizing a baby hat to exceed your expectations. We can't help but smile when we receive photos of our customers' babies wearing their new favorite accessory! The baby hats we knit are keepsakes that serve as fond memories of the first precious months of a baby's life. Colorful Crowns is proud to share in this joy!